As soon as Natalia told me she mailed me a piece of her handmade jewelry, my imagination got wrapped up in what it would look like. She offers such a ravishing range of unique designs in her Vancouver jewellery shop. When the smoky quartz pendant arrived, my daydreaming didn't stop. Now I'm fantasizing about autumn adventures as the sun sleeps. 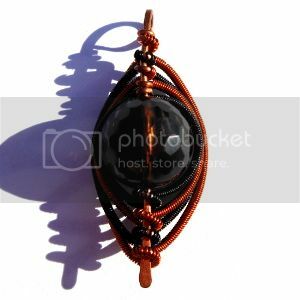 The black and orange wire combination reminds me of Halloween, my favorite holiday. The faceted focal bead shines in the light like the Hunter's Moon. But I won't be waiting that long to string it upon a black ribbon and wear the wire-wrapped pendant around my throat. This weekend is Maryland Faerie Festival and the necklace will be perfect with my black fairy wings. Oh, black fairy wings! Perfect outfit for the pendant! I am glad you like it and it is going to be worn! Enjoy! What a stunning piece! And with the faerie festival this weekend, it is definitely a perfect addition to black fairy wings! Natalia, I've said it before and I'll say it again- you're so talented!! Kristin, have fun at the festival! That is gorgeous. It looks like it could go on a harness type chain too.